For nearly 20 years, part of my weekly to-do list has always included one imperative: come up with an idea and then draw a cartoon. I’ve been drawing for as long as I can remember, inspired as a kid by late nights reading the gentle humor of Charles Schulz, and later when I went to college, the edgy feminist perspective of Jaime and Gilbert Hernandez and their great ongoing opus “Love and Rockets.” I also recall being enchanted by a dog-eared copy of “Lil Dan’l” cartoons created by George Akimoto for the Rohwer Outpost, and saved by Dad when he left camp. Wish I knew where that was today. 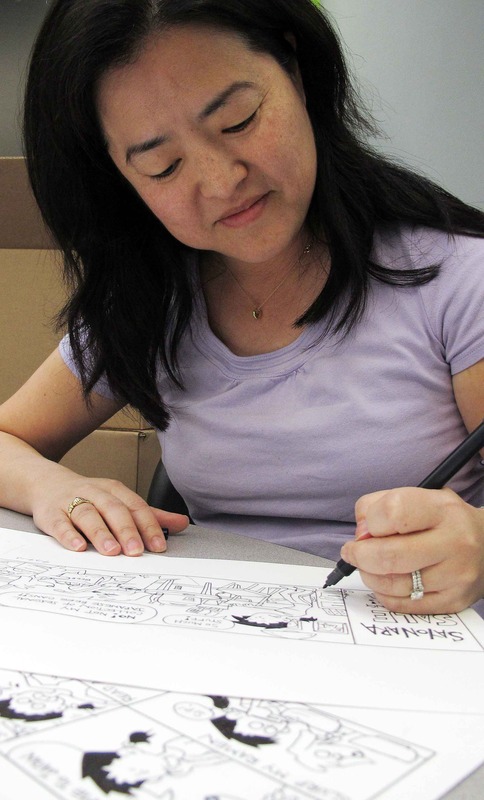 I started cartooning when I was at Pacific Citizen, just out of college, with a strip I called, “Small Kid Time” about an ordinary Japanese American family. The topics then were typically JA: waking up early to go fishing, making musubi with Bachan and of course, basketball. Pete Hironaka, who continues to submit editorial cartoons to PC, was incredibly supportive and inspiring. He gave me an autographed copy of his book, “Report From Round-Eye Country,” which also featured some of his commercial artwork. As a self-taught cartoonist, I’ve never had delusions of grandeur when it comes to my illustrations, but I love the freedom of a blank piece of paper and a pencil. With these simple tools you can create your own world. Gwen Muranaka began a regular comic strip with “Small Kid Time.” This one is from 1994. So when I moved to Tokyo in 1996, one of my goals was to start another cartoon. A co-worker at Japan Times, came up with the title “Noodles” (a play on Japanese noodles as well as nod to jazz “noodling” or riffing). With that I was off and running. For the past 17 years “Noodles” has appeared weekly in the pages of Japan Times. Peggy Mikuni of Yamato Travel was kind enough recently to send me a tear sheet of one of my strips during one of her trips to Tokyo, with a note written on Imperial Hotel stationery no less! Paul Terasaki also mentioned seeing the cartoon on one of his Japan trips, which was very encouraging. “Noodles” has a simple premise: the misadventures of Tracy, a naïve Japanese American girl, and her loyal dog, Stubs, coping with life in Japan. At the time, I really missed my dog back home and this was a way to take him with me to Tokyo. I’ve added characters through the years: an angry dog, Grubs, who is a proxy for some of the annoying things and obnoxious people you meet in Japan, and a typical Shibuya girl who I would send on mindless shopping excursions overseas during Golden Week. Occasionally, I’d touch on what it’s like to be Japanese American, invisible but still a foreigner, living among Japanese. I cringe at some of the work, but every once in a while, I’ve done one I’m pretty proud of, particularly a few after the 2011 earthquake and tsunami. “Noodles” has appeared in Japan Times since 1996. It is strange and sad then that this period of my life will come to an end very soon. In October, Japan Times is embarking on a new partnership with The New York Times, and will discontinue the cartoon page as a result. It’s been an honor to share the page with the excellent “Zero Gravity” by Roger Dahl. Dahl, who also draws opinion cartoons for JT, has been with the paper since 1991. A Tacoma, Wash. native, he moved to Tokyo, like so many, to teach English conversation. I have always admired his fluid, graceful lines and the insightful humor he brings to the experiences of being a gaijin. A strange fact is that both of us continued to draw our cartoons, years after leaving Japan. The editor side of me is glad that Japan Times is building outside partnerships that will hopefully keep it strong for many years to come. JT is an invaluable outlet, an independent newspaper with a staff of reporters covering Japan at a time when most news agencies are shrinking and turning away from international news coverage. Its audience is mainly foreign expats and Japanese nationals interested in a different perspective. Like all papers, it has gone through difficult times in recent years and this is a bold step forward. A Japan Times-New York Times partnership is not unlike the partnership Rafu has now with Sankei Shimbun, and before that, Mainchi Shimbun. On the flip side, without saying this is what’s happening at Japan Times, too many newspapers, in their desperation to stay afloat, are losing sight of their communities — precisely what makes them so valued. That’s apparent in the recent across-the-board revamp of the Daily Breeze, Pasadena Star News, San Gabriel Valley Tribune and other newspapers under the LANG (Los Angeles Area Newspaper Group) umbrella, that has turned each into cookie-cutter clones of one another. Even the perpetually-in-danger L.A. Times lately seems less like a newspaper than a Huffington Post wannabe. So much rehashed content and a focus on what will garner the most clicks. What is being lost is a sense of community that comes from lively local content and reporters who know their beats. When TJ Simers, longtime L.A. Times sports columnist, jumped ship for The OC Register, he said as much in a story published in USA Today. “The Times still offers a terrific newspaper, but there is a feeling there that the newspaper is dead and most efforts should be directed to the Internet while waiting to see who buys the paper. Just too many empty desks,” Simers said in USA Today’s Big Lead. The Rafu Shimpo, warts and all, is most definitely not a New York Times or even a Japan Times, but I believe The Rafu presents a true sense of where this complex, contradictory Japanese American community is at this time and place in our history. The voices it presents are unique and won’t be found in other publications. What is so remarkable about Rafu is that it has been that connection for the community for 110 years, a true achievement for all the reporters, editors, columnists and pressmen who came before us, as well as the Komai family, who have been its stewards for three generations. I’ve known about the end of my cartoon for months now and I am still torn over whether I will continue to draw after October. Stopping would mean no more late nights after work pounding my head on the table to come up with an idea — any idea — to make my deadline. I feel like over the years, I’ve created a body of work that speaks to my own experiences of Japan and its culture as a Japanese American. It has been such a part of my life that stopping feels like losing a part of myself. We’ll see, I just don’t know. All good things must come to an end. But sometimes endings are followed by new beginnings. Either way, it’s been a good run. Gwen Muranaka is English editor-in-chief of The Rafu Shimpo and can be reached at [email protected] Ochazuke is a staff-written column. Opinions expressed are not necessarily those of The Rafu Shimpo. Hi Gwen, It would be great to see a compilation of all your “Noodles” strips get printed! my wife, Lorol, and myself have greatly enjoyed the Japan Times’ comic strip you authored, Noodles. We encountered it while living in Japan from 1995 through 2005 and have continued readin it to this day. I was a senior professor in multimedia communications at a small university near Gifu-shi and my wife my faithful companion and best friend, stayed home to tutor our Asperger grandson and built up a circle of fantastic Japanese lady friends encountered from an English class she inherited from a good friends.I say all this so you will appreciate just how much we have enjoyed till now your and Roger Dahl’s comic strips … they spoke to us of a Japanese life one does not experience until thrust into it … we were the only foreigners around and on occasions, while on sorties with our daughter and beautiful grandson, we almost created havoc on the highway near our home as people stopped to point and stare. But, for all our foreignness, our “gaijin-ness,” we were treated warmly. I cannot express this well, but your strips gave perspective and insight that actually helped us deal with this fantastic and deep culture. We sincerely hope that both you and Monsieur Dahll continue to share with us your insights and observations. There is, Ms Muranaka, a genius in your work and that of M Dahl that must not be cut off nor lost. Your works contribute to a human description of that complex and subtle cutlure and society, one that is, I fear, still after all these years, not really appreciated or deeply understood by the average person in the United States and Canada. Please continue your work, even if you branch out into other areas.